It is my Christmas wish to dramatically speed up your cryptocurrency learning curve! I can start your education on the “inside looking out” rather than trying to learn about cryptocurrency “from the outside looking in”—and save you a fortune and a lot of time. How’s that for a Merry Crypto?! I have spent the last six months under the tutelage of a cryptocurrency mentor—a gentleman who is also a close friend. He and I have similar interests, similar intellects, business and political perspectives, etc., and he diverted off into cryptocurrency about three years ago. I continued with my pursuits and finally “our” learning curves are coinciding. He is far, far ahead of me but I am finally earning an inside track into the amazing world of cryptocurrency—for which I am ever grateful. If you’ve noticed, cryptocurrencies (bitcoin in particular) have gained value never imagined except in the fertile minds of a few visionaries. While I was not one of those original visionaries I am rapidly becoming far better informed—as you should as well. I recommend that you immediately drop what you are doing and set up a bitcoin trading account and a proper bitcoin wallet—in that order. Once you have done so, you embark on a journey that will make you wealthy, but more importantly, make you well informed—and better able to inform others. As an early adopter of a technology that is taking over the world—a financial instrument that replaces the old money system with the new—you are at the beginning of a massive shift in wealth—you are a part of it! Cryptocurrency is good for humanity and the reason for my interest. In becoming an early adopter, the opportunities are staggering. After all, since I have come in bitcoin in mid October of 2017, bitcoin has climbed from approximately $5500 a coin to $17,000 (mid December). 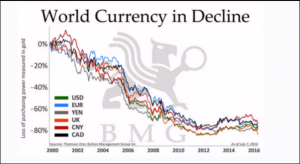 You buy fractions of a coin of course; growth is unprecedented and will continue to be so for quite some time because bitcoin (and other cryptocurrencies) are stable in a world of very unstable fiat currencies. In other words… as fiat currencies; as old infrastructures and gov become less stable, there is a massive migration to the more stable math based cryptocurrency. 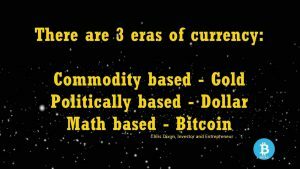 Cryptocurrency will replace fiat currency faster than you might ever imagine. Why? Because cryptocurrency is stable and will always be stable. Call me about this if you have questions. In the meantime, I very highly recommend that you open a bitcoin trading account paying one-percent a day. I recommend that you do it now; that you do it today (that you do it right this minute) and once you have done so (I will be able to see it in my account because I am sponsoring you) there is some very powerful information that I can share with you that will help you to understand the precipice on which you stand. Bitcoin is going to continue to climb for a very long time. And, cryptocurrencies will climb forever as a representation of humanity’s potential expressing (think about that statement) as we begin to control our own worth. You are at a point of becoming wealthy/very wealthy over the next several years AND as you become better informed, cryptocurrency will change your life like never before. The opening of the trading account requires the barest of identification because it is not a US product and not regulated by the US gov. While the US gov may attempt to suggest certain requirements, bitcoin and the trading is a global project. Because bitcoin trading is denominated in bitcoin instead of US dollars, there will never be a lawful accounting or reckoning. Opening a bitcoin trading account is simple. It requires the minimum of ID, the account is yours for life and as the world becomes denominated in bitcoin and other premium cryptocurrencies, you will find yourself in a very enviable (lucrative) position of starting out right. AND, once your trading account is open, I will be able to share a great deal of information with you that causes you to become informed, better protect/project your future, and find yourself very well positioned in the coming years. Begin by going to https://jhamilton.usitech-int.com/ and provide the required information. Be sure to use a 01 in front of your telephone number in addition to identifying your phone number’s country of origin, i.e., US is plus 1. Again, be sure to identify your telephone number with a 01 as in 01 310 878-2260. Once you have completed and verified your bitcoin trading account, contact me for additional information, i.e., set up a proper bitcoin wallet, etc. There is no cost to set up this account, and once you have completed the application, I can share information that will radically revise your understanding of an entry point into the world of cryptocurrency. I would encourage you to do this now; I would encourage you to do this now and I would encourage you to do this now. In fact, I would stop what you are doing and set up your account now. Once you have set up your bitcoin trading account, I will be able to guide you into the world of discovering and trading cryptocurrency for which your world will be forever changed. If you wish, call me and I can give you some help. Let me know when you have completed the bitcoin trading app found here and I will begin your education. Give yourself the most magnificent Christmas present you will ever receive: knowledge and wealth. PS Set up accounts for your kids with $100, forget them and let them trade. In a few years, they will contain a small fortune.